Ozark Trail 16-Person 23.5 x 18.5 Cabin Camping Tent is a huge 3-room tent with more than 20 square meters of the area. This is a very tall and pleasant 6-windows structure for summer camping. Huge and very livable tent. Obviously what you see here is a huge tent and I have included it in the list of extra large family camping tents – but you might be surprised to know that it is among the smallest tent in that list. So if you are curious how big the other tents are please see here. 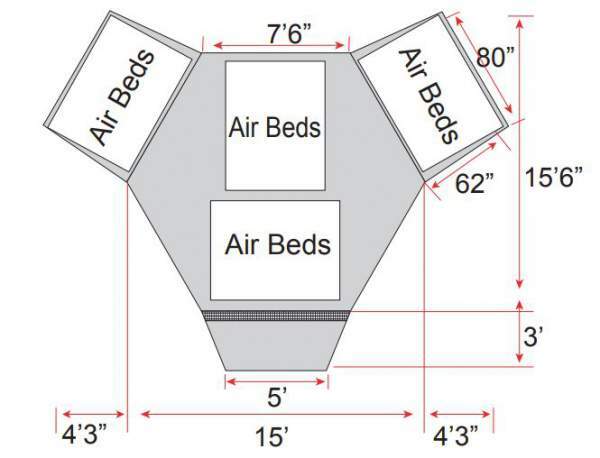 So now you realize the meaning of the numbers 23.5 x 18.5 in the name – those are feet, and they indicate the rectangular ground area which you need to set this tent up. This means 435 ft² (40 m²), but this is quite different from the actual inner floor area. So the floor plan is almost Y-letter shape, and the total area is “only” around 20 square meters (215 ft²). So the tent is indeed like a castle but this is still far less than what you might wrongly assume from the numbers in its name. Note that you have the porch area as well for sitting in the shade, it is around 1.5 square meters of space. The tent is cabin style with almost vertical walls, and with a minimal fly which only covers the ceiling. There are only a few guy out points, so this is a typical summer camping tent for mild weather conditions and without much rain and wind. The tent is a 3-room type, with a huge hexagon living area plus two smaller rooms. What you see above is also a porch area at the entrance to the main hexagon room. Note that the tent is not freestanding, it must be staked down. Sizewise, the tent is with the declared capacity of 16 people, this is what its name suggests. But the floor area which I gave above shows that you have only 1.25 m² (13.4 ft²) per person. Obviously, this space is hardly large enough for so many users, but it is big enough to accommodate 4 queen size beds which are shown in the picture above. I would say this is a tent for maximum 8 people. 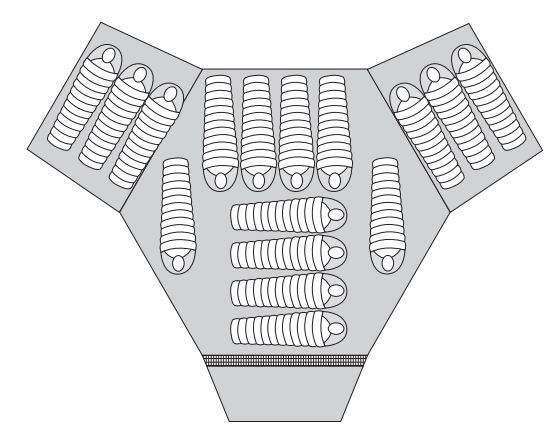 This is the suggested way of using the tent for 16 people. But such a huge structure packs to only 28.5 x 14 x 14 inches (72 x 36 x 36 cm), so this is really remarkable and small enough to be transported even on a motorbike. The ceiling is completely screen, see the picture below, so you can enjoy sleeping under the stars when the weather is great. The tent is surprisingly stable for such a huge structure and it holds up well even in windy situations. The top view which shows the roof poles and the mesh ceiling in all three rooms. Each of the three rooms has its own entry door and windows – you have 6 large windows in total. The two smaller rooms are with removable dividers so this is not a complete privacy, pity they did not build more substantial walls here. The tent comes with a port for the electric cable. There are pockets at various places here, 1 in each side room and around 7 in the main room, these include a media pocket, 3 bottle holder pockets, and 3 large storage pockets. They do not provide any information about the waterproof rating, my guess is it is not more than 800 mm. But if this is so, this should be enough for summer camping. The seams are sealed. For such a huge structure, the setup requires some work. It is necessary to stake it to the ground first, all stakes are included in the package. 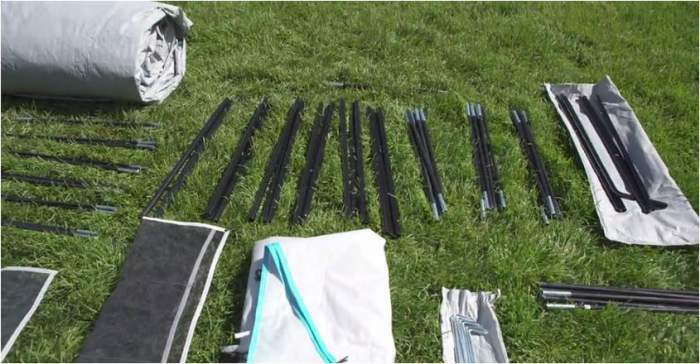 All the roof poles are fiberglass and the leg poles are metal, so you will know how to separate them from the beginning. Then start adding the 3 poles for the main dome part in the hexagon room. You have sleeves there so when all poles are in place make sure to connect them together with a strap in the center of the structure. There are also 6 poles that go along the perimeter of the hexagon (see the picture above), so these are next to be added. You have hub elements in the corners of the hexagon and they will help in connecting these roof poles with the 6 metal vertical leg poles. Next, you add the 2 fiberglass poles for the smaller two rooms, and after that the poles for the porch where you again have one roof fiberglass pole plus 2 metal leg poles. It is the easiest if two people do it together, in such a way all can be done in 20 minutes or so. The fly should be added by first fixing it at the porch and then cover the rest of the tent, for two people one on each side this is easy. After that add the dividers and numerous pockets and the job is done. Weight: 46.7 lb (21.2 kg). Ground dimensions: 23.5 x 18.5 ft (7.16 x 5.64 m). Floor area: 215 ft² (20 m²). Area per person: 13.4 ft² (1.25 m²). Peak height: 83 in (211 cm). Packed dimensions: 28.5 x 14 x 14 in (72 x 36 x 36 cm). So I hope that you now have a more clear idea of what Ozark Trail 16-Person 23.5 x 18.5 Cabin Camping Tent is. The structure needs a lot of ground area to set it up and perhaps this can be a problem in some camps. 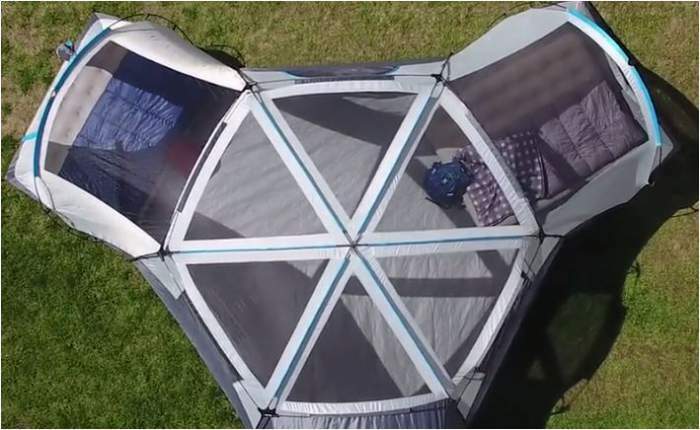 But in any case, this is an extraordinary design, very pleasant and most suitable for summer camping in a mild climate and without a lot of rain. With so much mesh on the ceiling, you would not want to use it in a cool area, there are more suitable tents for such a use. You might want to compare it with this new Wenzel Mammoth 16-Person Family Dome Camping Tent. If you need something even bigger, check my page with the extra large tents. You will see its bigger cousin built in the same style, but for 20 people. But if you need something smaller, just look around in the site, it is all about family camping tents and tents for groups, so you will surely find something suitable. Thank you for reading, and please use the comment box below if you have a question or comment. Have a nice day.